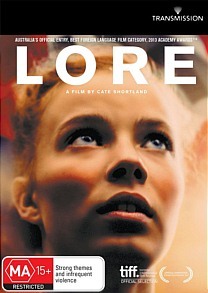 Lore DVD Review Buoyed by lush yet understated visuals, some impeccable performances and a stirring score from British composer Max Richter, Lore is yet another poetic and compelling cinema experience from one of Australia’s premier filmmaking talents. Cate Shortland’s feature length debut Somersault was a revelation in Australian cinema. Not only did the emotionally beguiling and subtlely evocative coming-of-age drama help launch the careers of stars Sam Worthington and Abbie Cornish, it took home no less than 13 gongs at the 2004 Australian Film Industry Awards and proved that Shortland, then a feted short film director, could turn her hand equally as effectively to full length projects. Shortland’s 2012 follow up Lore has also been enthusiastically received, taking home Best Film awards at the Stockholm and Locarno International Film Festivals and garnering some superb reviews in the process. Set in the closing weeks of World War II, the film follows the fate of five German children left to fend for themselves after their parents, an SS officer and his stanchly National Socialist wife, are interred by the soon-to-be-victorious Allies. Forced to traipse across their ruined country to an aunt and uncle in Hamburg, the children, led by 14-year-old Lore (stunning newcomer Saskia Rosendahl), are forced to endure the tripartite shock of simultaneously losing a war, their parents and the safe haven of their middle class Nazified existence. Buoyed by lush yet understated visuals, some impeccable performances and a stirring score from British composer Max Richter, Lore is yet another poetic and compelling cinema experience from one of Australia’s premier filmmaking talents.